Cervical cancer rates in Haiti are among the highest in the world. MFP initiated a cervical cancer detection and treatment program in May 2010 at the Alma Mater Hospital in Gros Morne. While the cornerstone of the program is cervical cancer screening and prevention, the program provides a general gynecological examination, testing for sexually transmitted infections (including HIV screening), breast examinations, and counseling services in health-promoting behavior. The MFP program is a collaboration between Haitian and U.S. health professionals, and is one of the few high-volume cancer screening programs in Haiti. Implementation of a cervical cancer awareness program in the community. Women groups have embraced the program and taken ownership and pride in the accomplishments of the program. The education program has many components, e.g. radio interviews and spot messages, announcements from the pulpits of Catholic and Protestant Churches in Gros Morne, Cancer Awareness Month initiatives, targeting of specific women groups, such as women workers( ti machan) in the market, and AIDS patients. The cancer awareness program continually changes and embraces new groups of women susceptible to developing cancer. Training of Haitian medical personnel to be competent in the diagnosis and treatment of early cervical cancer. 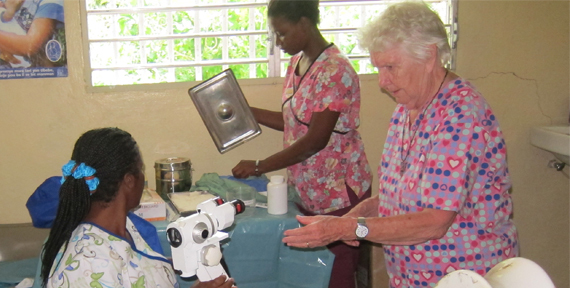 Two Haitian nurses (Orna Louise Dieuaume, Cecily Seide) have been trained to recognize cervical dysplasia (pre-cancer) and cancer by colposcopy, and the treat dysplastic lesions using cryosurgery. They have been competent in performing PAP tests, and biopsies. Critical to cancer diagnosis is the recognition of other non-malignant gynecological conditions, including infection, and initiating prompt treatment. We have instructed two Haitian gynecologists on the essential aspects of colposcopy and cancer recognition. Also, we have instructed Haitian physicians in the general medical and AIDS clinic on the early signs and symptoms of cervical cancer, and the need to refer all women to our clinic. Development of the referral infrastructure to diagnose and treat cervical cancer in rural Haiti. A number of seemingly intractable hurdles were overcome in the past two years to ensure the success of the program. These include establishing a referral network of pathologists, radiologists, and surgeons to provide services to our patients, establishing funds to reimburse our patients for medical services they are unable to pay for, and providing transportation for patients and specimens to Gonaives and Port-au-Prince, to name a few. Development of both a hospital-based and mobile cervical cancer detection program. We have used the dispensary at Pendu, approximately one hour north of Gros Morne by van, as a model for the development of a mobile cervical cancer detection program. The dispensary has a gas-run electricity generator which enables us to do colposcopy. We bring a nitrogen oxide tank with us for cryosurgical procedures, as well as the necessary instruments and equipment to conduct the clinic. The nurse in charge of the clinic publicizes our program prior to the clinic, and we see an average of 20-25 women on each visit. Development of cervical cancer detection procedures manual in Creole for use in other hospitals in Haiti. We have developed a clinic procedures manual in Creole which will be exceptionally useful for both rural and urban hospitals, and dispensaries eager to establish a cervical cancer detection program. The manual includes lists of necessary equipment and instruments used in a screening clinic; instruction for maintenance, cleaning, and sterilizing instruments; treatment guidelines for malignant and non-malignant gynecological conditions; treatment, referral and follow-up forms; data codes to be used to enter patient data into Excel spread sheets, and other instructions and forms to establish a well-run and efficient cervical cancer detection clinic.